You need to make your choice of the trailer has enough space and capacity to accommodate your excavator and the weight of the attachments you’re transporting, it will generally be an RGN, step deck or flatbed trailer. 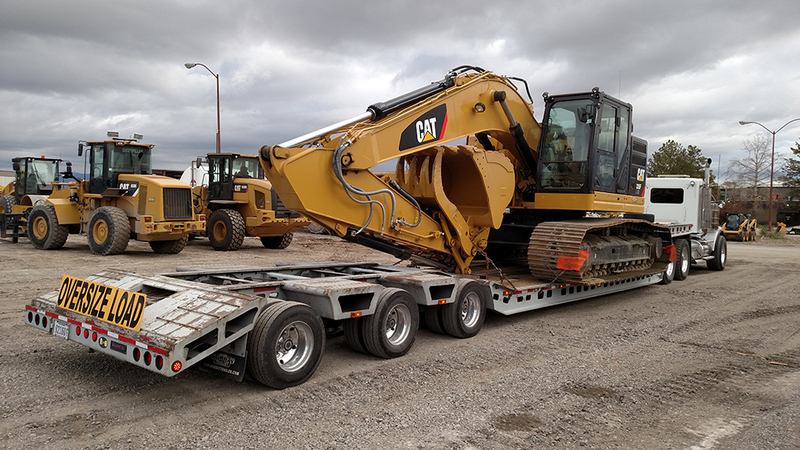 Since most excavators are generally an oversize load, you will require a larger transportation device with a higher weight rating to handle your weight correctly. You can find out the weight rating of the trailer on owners equipment manual or the identification plate. 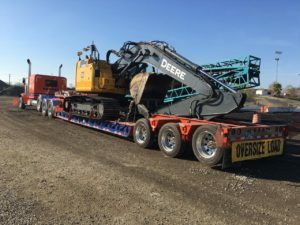 Since load ratings vary in different states, you need to be aware of the state, local and federal laws and regulations concerning weight width length and height of the excavator before making the necessary arrangement to transport your machine on public roadways, highways, bridges, and interstates. Depending on the size of your excavator, there are quite a good number of trailers used for transportation. They include RGNs for transport of larger excavators, step deck trailers or hotshot trailers for transportation of small excavators or flatbed trailers for transportation of medium-sized excavators. Other trailers available for transportation of excavators are double drop decks and extended double drop decks. Make sure you are aware of how to operate the machine you are loading correctly. Select Ramps that are designed to handle the weight of the machine you are loading. Also, if necessary add blocks under the ramps for support. Remove any grease, debris or mud that might be in the ramp or on the machine you are loading that could cause the device to slide. Turn the engine of the excavator on, reverse it, and with the heaviest side of the excavator travel up the ramps. Maintain the slowest speed possible while going up the ramp until you make sure the excavator has settled on the trailer and positioned in a way that its weight is evenly distributed to prevent any pull or tire wear during transportation. Once the excavator is on the transportation trailer, securing it into position is an important part that plays a vital role in determining whether your excavator will arrive at its destination safely and securely. Following the following guidelines will help you to ensure you properly secure the heavy equipment for transport. Stop the engine and disconnect the battery connection points to off position. Disconnection ensures the engine does not restart during transit. Lock all the doors and covers of the excavator before you start transportation. If the excavator has articulation points, pivots or hinges, ensure they have articulated frames and lock them before you start transportation to prevent articulation while on transit. Place all the wedges, cradles, chocks and other means behind each wheel of the machine to firm them and prevent shifting or rolling during transportation. Install tie-downs on the rear and front-tie downs positions. Most manufacturers recommend a minimum of four tie-downs to prevent any movement. always use maximum securements and connection points to maximize effectiveness and minimize damages during transit. Before hauling, inspect all the tie-down equipment and tie-down points used to secure the machine. If you find any fatigued links, stretches or cracks remove the tie-downs and services them. Make sure all the tie-downs equipment meets or exceeds the machines weight rating. Additionally, verify the excavator’s tire pressure before you start transporting to prevent any tire leaks or improper inflation which can cause loosening of the tie-downs. Securing the excavator’s attachment and accessories are equally important.If possible, secure all the attachment to the machine during transit. If it is not possible, set the accessories on the trailer in an orientation that can allow chains and straps to contain them and prevent any movement during transportation appropriately. For smaller excavators, ensure the buckets and other attachments are adequately secured to the trailer. Set all the hydraulic attachments and hoses in an orientation such that they do not interfere with the equipment in the trailer. Ensure all the hoses lies underneath the equipment and are located in the way of the tie-downs or connect in a way they won’t be disengaged because of movement. Excavators are heavy equipment, and their transportation is not a small deal. It requires proper observation of details especially in loading, positioning and securing the material on the trailer to prevent any movements, shifting or tilting during transit. Proper securing of the machine’s attachment and accessories is equally important to ensure there is no interference which can cause damage to the equipment or the transportation machine. 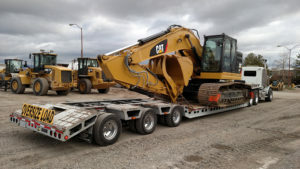 Once you are set and have followed all the stipulated guidelines transportation of your excavator should be seamless, and you have nothing to worry about. You can be sure your equipment will reach its destination safely, on time and in its original condition.